hearth/myth: Land, Sea, Sky: the blog posts, vol. 4. Land, Sea, Sky: the blog posts, vol. 4. 1. Crosswind is here! It's now available as an e-book at Amazon and Smashwords, and as a paperback through CreateSpace. I expect the Smashwords edition to migrate to Kobo, B&N, and other retailers shortly, if it hasn't already. And I just noticed the paperback is up at Amazon! It should be available from other retailers within the next couple of weeks. 3. Don't forget about the big Master Koda Black Friday/Cyber Monday promotion coming up next weekend on Facebook. I'll be hosting on Cyber Monday (December 2nd) from 7pm until 9pm Eastern time, and I've got some fun stuff planned. But the best part for you guys is that the authors participating in the event are marking down some of their books to 99 cents for the weekend. You can click here to get to the event page on Facebook. Hope to see you there. I promised to wrap up my "Land, Sea, Sky" posts this week by explaining the structure of the series. That's not all that complicated, so I thought I'd throw in a few Fun Facts to Know and Tell, too. When I first started thinking about a follow-on series to the Pipe Woman Chronicles, I knew one thing for sure: the Morrigan was going to be in it. I don't know why, other than the fact that She is generally perceived to be one of the darker goddesses in the Celtic pantheon, and I expected this series to be a little less lighthearted than the Pipe Woman Chronicles (if you can call Naomi's story lighthearted). Three words of counsel: know thy power, know thy wisdom, know thy time. Three candles that illume every darkness: truth, nature, and knowledge. Three things it is best to leave alone: a strange dog, a sudden flood, and one wise in their own eyes. 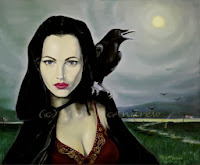 On top of all that, the Morrigan is a triune goddess, comprised of Badb, her warlike aspect; Macha; and Anann, her Earth aspect, after whom twin hills in County Killarney, Ireland, are named the Paps of Anu. Having gotten this far, it made sense (to me, if no one else) to have each book in the trilogy dedicated to one of the sacred realms. And it also made sense to have three main characters, with each sort of representing one of the three realms. That's why I've been saying cryptic stuff like, "I consider Crosswind to be Tess's book." Crosswind is the Sky book -- hence the wind turbine on the cover -- and it's Tess's book because she is a journalist, and communication is related strongly to the element of Air. Also, the book is set in and around Washington, DC, which, as we all know, is chock-full of hot air. Undertow is the Sea book, and it's Darrell's book both because he is a sailor, and because Water has always been important to the Potawatomi way of life. And not just for fishing: the Ojibwe, another Anishinaabe people, still harvest wild rice by rowing their canoes into a stand of the plants and beating them until the seeds fall into the canoe. The plot of Undertow takes place in Hampton Roads, VA -- mostly Norfolk and Virginia Beach. The "roads" in the name Hampton Roads refer to the Elizabeth, Nansemond, and James rivers, which join there before emptying into the Chesapeake Bay. Okay, so, Fun Fact to Know and Tell #1: We used to live in the townhouse where Sue, Tess, and Darrell live. It's in Alexandria, VA, in a complex called Brookville Townhomes, which is bordered on the south by Holmes Run Park. In one scene in Crosswind, Sue walks over to the park to sit by the creek and do some thinking. Here's a photo of the creek that my daughter Amy took. It was taken downstream from Sue's vantage point, but it should give you an idea of the setting. Amy took lots of pictures of Holmes Run when she was in high school, and I've got a few of them on a Pinterest board here. Fun Fact #2: We lived in two different townhouses in Brookville; for this series, I put the kitchen (and its pass-through) from one into the other one. The teeny-tiny bedroom that Darrell rejects? That was my room. But one detail I did not change was the infestation of spider crickets in the basement. And Fun Fact #3: The Potawatomi own and operate several casinos. One of them is in New Buffalo, MI, which is about 15 minutes from the house where I grew up. So there you go. Hope you like the series. I think I'll go now and try to knock out a few more words on Undertow. Happy Thanksgiving! These bloggy Fun Facts to Know and Tell have been brought to you, as a public service, by Lynne Cantwell. Land, Sea, Sky: The blog posts, Vol. 3. Land, Sea, Sky: the blog posts, vol. 2. Land, Sea, Sky: the blog posts, vol. 1.